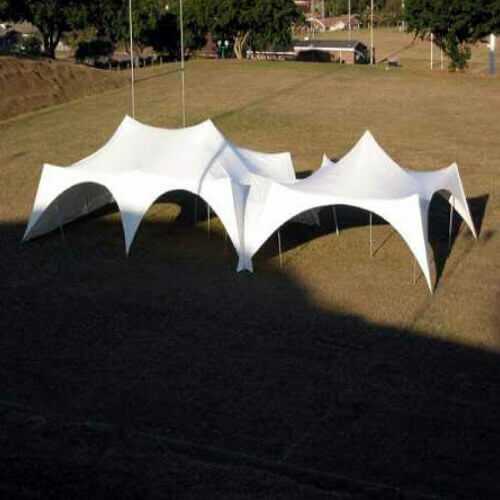 The Royal Jasmin Tents for sale is an alternative option to the standard Gazebo Type tents, offering a unique, futuristic look as well as a practical, functional design. Royal Jasmin tents are great for weddings, birthday parties, corporate parties, anniversaries parties, or even to create a cozy and lavish cabana lounge in your home backyard. The Royal Jasmin tents for sale is remarkably easy and quick to install, with the largest option assembled in less than 15 minutes, with two relatively unskilled persons. Royal Jasmin tents are great for weddings, birthday parties, corporate parties, anniversaries parties, or even to create a cozy and lavish cabana lounge in your home backyard. The aesthetics of the Jasmin tents for sale sets it apart from its competitors, offering an interesting alternative to the standard Gazebo type ‘ marquee. Although the Jasmin tent is not extendible, it is able to be joined to another of the same size, with a purpose-made, guttering system.